The walk starts from the Town Center shopping center parking lot at Burke Centre Parkway and Burke Commons Road. Shopping center parking is available on both sides of Burke Commons Road. Burke Commons Road becomes Pond Spice Lane on the south side of Burke Centre Parkway. Cross Burke Centre Parkway from the northwest corner of the intersection with Pond Spice Lane (Burke Commons Road) where a Walk light is available. Turn right onto the asphalt path on the southern side of the road. The pathway enters the woods. Do not turn onto the next side trail to the left. At the next path intersection turn the corner going to the right so as not to enter the town house area. Continue with the woods on your right and houses on your left. The next side trail is perpendicular to the trail you are on. Turn left to follow the sidewalk in front of the houses. At the end of the straight section of sidewalk turn right to follow the gravel trail between the houses. The trail brings you to another sidewalk in front of houses. Walk to the end of the straight section of sidewalk. An asphalt trail extends beyond the sidewalk. Follow this trail until it ends at another trail intersection. Turn right to follow that trail a short distance to a bridge and a road. Just prior to the bridge turn left to follow the intersecting trail. After a short distance the trail turns left and continues through a narrow wooded area. The trail turns slightly to the left where it meets an intersecting trail. Turn right to continue walking through the wooded area. The trail turns slightly to the right just prior to a fenced yard. There is a tot lot just prior to the next trail intersection. Turn left onto the intersecting trail. The trail turns right and then left to continue through the wooded area. The trail reaches a cul-de-sac at the end of Belleair Road. Turn right and follow the sidewalk along the other side for several blocks. Turn left at the asphalt trail after crossing Ormandy Drive. The trail follows a stream on the right. Turn right at the next trail to cross a bridge over the narrow portion of the pond. There are numerous scenic views of the pond from this portion of the trail. Turn right at the next trail intersection to follow the stream away from the pond. The trail crosses Windward Drive and continues to follow the stream. Turn left onto the bridge over the stream just prior to the next pond. The pond should be on your right as you walk around it. Continue on the path to the right around the pond at the next trail intersection. Continue on the path to the right at the next trail intersection. Go straight at the intersection with the next trail that crosses the pond dam. The trail follows the stream away from the pond. The trail crosses Wilmington Drive, turns right and crosses the stream, and turns left to continue along the stream. The trail appears to end at an intersecting trail. Turn right to cross the bridge and turn left to continue along the stream. The trail passes the side yards of homes at the end of Windward Drive. The trail crosses a bridge over a side stream. Turn left onto the intersecting trail on the other side of the stream. The trail follows the stream up the hill. There is a tot lot just prior to a pond at the top of the hill. Turn left onto the trail after the tot lot. After going only a few feet turn right onto the intersecting trail to walk around the pond with the pond on your left. A trail intersects from a bridge on the left. Keep on the present trail as the trail follows the stream leading into the previous pond. At the next trail intersection keep to the left so that you go between the houses. The trail crosses Wilmington Drive and reaches another pond on the other side of that road. Turn right to walk around the pond with the pond on your left. On the other side of the pond take the intersecting trail to the right between the houses. Turn left onto the sidewalk after reaching the next street (Winter Park Drive). Walk a short distance to Mantle Road and take the sidewalk along the right side of that street. After passing 2 homes on the left side of the street turn left and cross the street to follow the asphalt path between the homes on the other side. After going between the houses the trail passes a court on the left. Continue on the present trail past trails intersecting on both sides of the court. The trail goes between the houses on the other side of the court. Turn right at the sidewalk at the next street (Wicklow Drive) and walk to the end of the street. Walk through the gap in the fence next to the gate and turn left onto the paved driveway on the other side of the gate. The driveway is part of the grounds of the Burke Centre Conservatory. This organization is similar to the Reston Association. The driveway curves to the right. Follow the gravel path to the left from this point. The path becomes a concrete sidewalk and goes between the houses. Turn left onto the sidewalk at the next street (Beacon Pond Lane) and follow it to the next street. 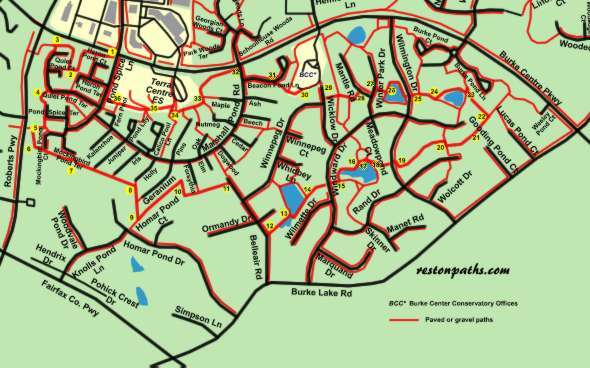 Turn right and follow the sidewalk along Marshall Pond Road to Burke Center Parkway. Cross Marshall Pond Road and take the asphalt path into the woods on the other side. There are several power transformers at the start of the path (the picture shows the path after the transformers). The trail meets numerous other trails that intersect from the left. Keep to the right at all these points until the trail to Terra Centre School is reached. After reaching the marked trail to the right to Terra Centre School take the trail to the left for a short distance. Take the next trail on the right up the hill towards Terra Centre School. After reaching the driveway at the top of the hill turn sharply to the left and go past the vehicle barrier across the driveway. Several trails go to the right up to the school and to the athletic field. Other trails intersect to the left coming from the houses. Stay straight on the present trail so that you continue across the school grounds next to the homes on the left. Turn right onto the sidewalk at the intersection with the next street (Pond Spice Lane). The starting point for the walk is just beyond the traffic lights at Burke Centre Parkway and Pond Spice Lane.